Anytime somebody says the Toronto Blue Jays need to sign a big-name closer, there is one name that is brought up time and time again to refute that point: B.J. Ryan. The 5-year $47 million dollar contract given to Ryan is used as a prime example why closers should not be handed long-term contracts. And yet, closers continue to reel in big deals, as Jonathan Papelbon proved last week. So should anyone be surprised that the asking price for free agent closers are astronomically high? In order to learn from one’s mistakes, sometimes it’s best to venture into the past and look back at what went wrong. It’s a subject that only a self-admitted masochist might delve into, but considering that the Blue Jays are currently in the market for a closer, I think it’s only fitting to revisit the B.J. Ryan contract. Let me first paint a picture for you to give you an idea of what the landscape looked like for the Blue Jays following the 2005 season. After finishing with an 80-82 record, J.P. Ricciardi had been given the green light to ramp up the payroll, and with some cash to burn, J.P. inked B.J. Ryan to the most lucrative deal in baseball history for a closer. The crux of the argument I’ve always stuck by after all these years is that the Blue Jays should not have signed a capital “C” closer who only had one year’s experience prior as a closer in the first place. I’m not necessarily saying every closer that signs a contract has to be experienced in that position, but it only bodes well … especially if they’ll be with the team multiple years. B.J. Ryan may have been the best closer out on the free agent market, but I certainly wouldn’t say he was one that warranted being awarded the highest paying contract ever for a closer. But the Blue Jays had money to burn, and so they locked up a closer and continued to assemble their 2006 roster. Despite the huge price tag, B.J. Ryan immediately made an impact with the Blue Jays that first season of his deal. The honeymoon season in 2006 with Ryan was awesome; he captured the fans with his enthusiastic run from the bullpen and the celebratory fist pumps. Within that first season, Ryan proved any doubters wrong by having one of the best seasons by a reliever ever in Blue Jays history. If Ryan’s 2006 season was any indication of what was to come, then the ninth inning was something they wouldn’t have to worry about in a long time. The announcement that B.J. Ryan would have to undergo Tommy John surgery was a huge shock at the time. Ryan was a pillar of that Blue Jays bullpen, and it felt like things might crumble without him. However, Jeremy Accardo and Casey Janssen stepped in and bolstered the back end of the Blue Jays bullpen quite nicely. As exciting as it was to watch B.J. Ryan, I think in the back of my mind I pondered “if a relative unknown like Accardo can fill in as closer on a league minimum salary, why do the Blue Jays need to pay B.J. Ryan almost $10 million a season to do the very same thing. 2008 was the inception of what Stoeten coined as “Uncle B.J.’s Wild Ride”. Ryan came back from Tommy John surgery but did not have that same poise as his inaugural season with the Blue Jays. Compared to 2006, his K% dropped from 31.9 to 23.3 and his BB% ballooned from 7.4 to 11.2. And then 2009 was the beginning of the end. Ryan started the year as the closer, but those control problems reared its ugly head once again. B.J. began to find himself inserted in progressively lower and lower leverage situations until he was eventually let go by the Blue Jays on July 9th 2009. At the time, I suppose J.P. Ricciardi thought that the best course of action was to cut ties with Ryan and eat the remaining $15 million dollars on his contract. And since B.J. couldn’t even pitch his way out of the bottom of the fourth inning without getting lit up, the writing was on the wall. Of the 40 final batters that B.J. Ryan faced in 2009, he only managed to retire 25 of them. At that point, I can’t say I blame the Blue Jays for letting go of Ryan. However, they were the ones who got themselves into that mess in the first place. If we go by FanGraphs dollar value statistic, B.J. Ryan would have had to put up five consecutive 2006 season’s worth of value to get anywhere remotely close to the $47 million dollars the Blue Jays paid him. Basically, Ryan needed to string together five career years to justify that price tag. Unless you’re Mariano Rivera, it’s damn near impossible to expect a player to consistently perform at that level, let alone a relief pitcher. The closer’s position is an ever-revolving door, and locking into one player for that dollar amount and duration is like playing with fire. The optics of the signing also may have had something to do with it; it may have partially been about the message Toronto wanted to send to the rest of the AL East. The signing of B.J. Ryan and A.J. Burnett combined with the acquisitions of Troy Glaus and Lyle Overbay signaled that the Blue Jays were willing to up the ante and spend the cash to build a winner. However, they learned one very expensive lesson with B.J. Ryan – paying top dollar does not equal top talent. If anything, it means paying top dollar could mean you end up with the equivalent of a very expensive paperweight. 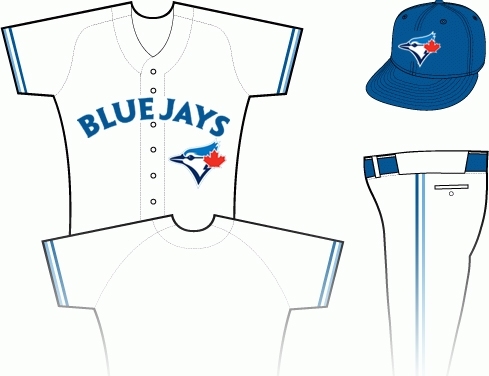 Could These Be the New Blue Jays Uniforms? While paying BJ (or any closer for that matter) big bucks wasn't the best use of Ted Rogers money, I feel it is unfairly criticized due to bad luck. BJ was a relatively young guy, with (as I recall) a healthy track record, had shown dominant stuff, and in his 1 healthy year as a Jay was amazing. You can argue that he was not worth the money amazing just due to the nature of the reliever position, but he was still really good. Then his arm blew up. Could have happened to anyone. Could have happened to Rivera over all those years the Yankees paid him, could happen to Sabathia, or Haladay, or Cliff Lee, or any other talented big money pitcher you can name. Doesn't even need to be a pitcher, Jose Bautista could hurt a knee, wrist, have a concussion, or whatever, and never be the same player again. But it happened to Ryan, and now his contract is pointed to as being so awful, when in reality it was just kind of bad with some bad luck. But the thing is, I don't remember people pointing out Ryan's horrible mechanics until after his arm gave out. And in fairness, Ryan was worth 3.4 fWAR in 2004, 2.7 in 2005, 2.9 in 2006. xFIP of less than 3, every year. So, a pretty solid track record, and it's arguable that 2006 wasn't Ryan's career year, in terms of WAR anyway. So to reiterate what Anonymous said… the Ryan deal was a mistake in retrospect largely because of bad luck. That, and the Jays not really being close enough to the playoffs to justify throwing money at a guy whose sole role was to close out big games. Anon, at the time of the signing, I remember most people being stoked about the deal. No longer would the Blue Jays have to rely on the myriad of closers (Frasor, Batista, etc), and Ryan looked like a very stable option. Even though there was almost no possible way he could've lived up to that contract, I would've been happy with 3 fairly successful years out of the 5 year deal. Unfortunately, one was Tommy John recovery and the other was just spent receiving cash from the Blue Jays. Again, it just reiterates the danger of signing a guy who pitches so few innings to such a big contract. Robbie, I can't remember which message board/blog I read this on, but I think it said something to the effect of "if the Blue Jays still aren't contending, do you think they'll look back and wonder why they spend so much money to marginally upgrade their closer's position?". That's what I think it all boils down to – it's not really Ryan's fault for the injuries, etc … it's much like with Vernon Wells, the dollar amount attached to him made the expectations astronomically high.